Calls to book your hotel for an exhibition, forms to sign-up for the International Fairs Directory, e-mails to buy contact lists for major trade shows. Again we warn you not to answer any of these scamming companies that are targeting the horticultural trade fairs. "Good morning! I'm calling you regarding your hotel reservation during the Canadian Greenhouse Conference. We want to offer you the best hotel rates and help you with your booking, as hotels are filling up rapidly." Just like other major exhibitions the exhibitors with the Canadian Greenhouse Conference are targeted by swindlers. They have been receiving phone calls or emails from different companies (i.e. Conventioneers) claiming to be acting on behalf of the CGC to book hotel rooms, exhibit space or provide attendee contact information. This is fraudulent activity. "The CGC does not engage third party companies to book hotel rooms or exhibit space nor do we rent or sell attendee contact information", the organisation shares. The same goes for other exhibitions - if it's Cultivate, Indoor AgCon or any other major show. Please make your hotel bookings via a trusted contact and not a questionable phone call. Besides the calls for hotel rooms there are also the contact lists, exhibitor lists and the International Fairs Directory. This week for example again swindlers have targeted GreenTech participants. 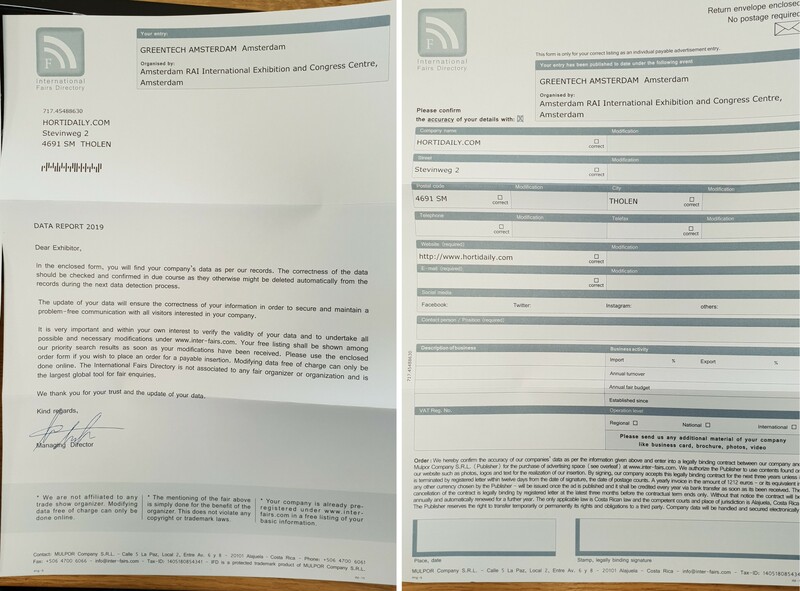 Fraudulent forms have been sent to various offices, which appear to be connected to the exhibition, but which are, in reality three-year contracts for a dubious website. The letter is accompanied by a partially filled in form with company data. If you complete the form and return it, you will be billed 1,212 euro for an entry in the International Fairs Directory. Moreover, the contract is valid for three years. The form states the name of both GreenTech Amsterdam and the RAI. We would like to expressly state the following again: the GreenTech Amsterdam organization has no connections whatsoever with the company International Fairs Directory, and therefore takes distance to these forms. It is advised not to fill in these forms. The same goes for forms including names of the IPM Essen, Fruit Logistica or any other trade show. And as we're filling up the list of scamming in the industry, let's not forget about the market reports. "The vertical farming market is estimated to be valued at USD 5.80 Billion by 2022, growing at a CAGR of 24.8% between 2016 and 2022." Please don't fall for these lines, don't include them with your press release or research and don't pay good money to receive the report. Of course there are market reports worth the money, but before you invest read what we published about these reports last year. And ask yourself this: if it looks like a duck and quacks like a duck, do you really want to spend seven grand taking a chance that this might just be the one duck that lays golden eggs?